Disney has locked down some release dates for some very big upcoming movies, several of which are now set to bow in 2019. Firstly, they have announced that Jon Favreau's remake of The Lion King will now be arriving in theaters on July 19, 2019. They have also finally given a firm release date to Frozen 2, which will have a winter release on November 27, 2019. Director Jon Favreau took to Twitter in order to confirm that his upcoming live-action remake of The Lion King has locked down a release date. He didn't have much to say about it, simply posting a lion emoji next to a crown emoji with an exclamation point and a picture showing the new release date. That July 19, 2019 release date previously belonged to Indiana Jones 5, but Disney has moved that sequel to July 20, 2020. The Disney Animation Twitter account confirmed the new release date for Frozen 2, which has been in the works for quite some time but hadn't previously been given a timeframe for release. The tweet was appropriately accompanied by a gif of Olaf yelling excitedly. "Frozen 2 is coming to theaters November 27, 2019!" The Lion King remake comes on the heels of several very successful, similar remakes that Disney has pursued in recent years. Movies like Alice In Wonderland, Cinderella, Beauty and the Best and The Jungle Book, which Favreau also directed, have all made big bucks at the box office. The Lion King will implement the same technology used to bring the animals and environments to life in The Jungle Book, but without any actual human characters, it won't technically be a live-action remake, since those environments and animals were all CGI. The casting process for the movie is ongoing right now, but Donald Glover has been cast as the voice of Simba, with James Earl Jones set to return as Mufasa. Seth Rogen and Billy Eichner are playing Timon and Pumbaa. Beyonce is reportedly the top choice to play Nala, but she has yet to sign on the dotted line. As for Frozen 2, it is going to be a better late than never kind of thing. 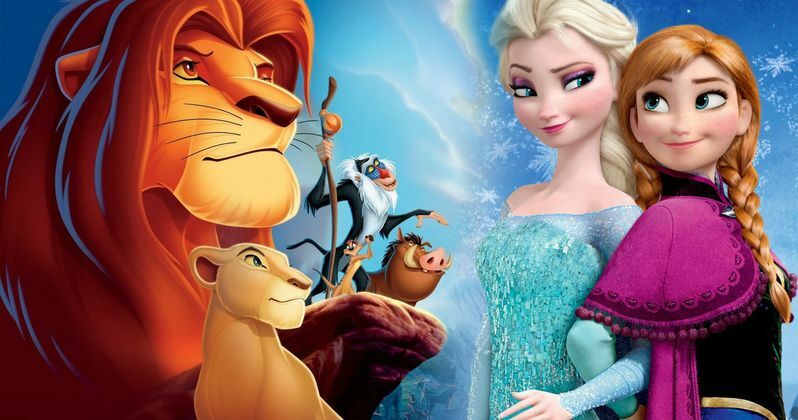 The original Frozen came out in 2013 and became one of the biggest animated hits of all time. The movie grossed a truly impressive $1.27 billion worldwide, not to mention all of the merchandising money that Disney made from it. The soundtrack was a massive success, topping the Billboard charts and going multi-platinum. The first Frozen was also released in November, so it looks like Disney will be going with a similar release strategy this time around. Directors Chris Buck and Jennifer Lee are returning to direct, with the principal voice cast all coming back as well. Disney also firmed up a May 24, 2019, release date today for Star Wars: Episode IX, in addition to announcing the Frozen 2 and Lion King dates. Not to mention that Captain Marvel and Avengers 4 are also set to arrive in 2019 as well. That means 2019 should prove to be a massive year for the Mouse House, assuming these movies can deliver in terms of quality. If recent history is any sort of indicator, they almost certainly well.